Until recently, there was little public information about job impacts in the area hit most directly by the nation’s toughest mandates for emissions cuts: California’s San Joaquin Valley. The Valley is dominated by high-emitting industries including petroleum extraction, power plants and dairy farms – so if Trump’s climate denier talking points were true, this area should have suffered severe job loss as emissions reductions forced employers to cut production and lay off workers. But the day before the president’s inauguration, we published an in-depth research report on those effects. The results were unambiguous: Even after accounting for as many of the costs as was possible, the state’s climate policies and programs have had a positive impact on the region’s employment and economy. While the report received considerable media coverage, including the LA Times, Fresno Bee, Capital Public Radio, and an op-ed in the Sacramento Bee, this post highlights the impacts on the region’s workers of three major components of California climate policy: cap and trade, the Renewables Portfolio Standard, and energy efficiency. From an economy-wide perspective, the cap-and-trade program has a very small impact in the San Joaquin Valley since it represents less than one half of one percent (0.4%) of the gross regional product. Still, if over time, the emission-intensive industries slowly contract due to cap and trade, employment data suggests that job creation from the investment of cap-and-trade revenue should offset any job losses. In addition, growth in other middle class blue-collar careers should continue to expand as a result of California’s Renewable Portfolio Standard and energy efficiency policies. In our research on the cap-and-trade program, we found that the industries with higher compliance costs, like oil and gas extraction, are generally more capital-intensive than the industries that benefited from the new investments, which were more labor-intensive. In estimating the region’s cost of compliance with cap and trade and measuring that against the investment of cap and trade revenue into the region, we estimate positive net employment of about 700 jobsi over the first three years of the program (2013-15). While the data suggests that any job losses should be outpaced by job creation, assistance with transition to retirement or other careers for displaced worker may become necessary. So far, however, the cap-and-trade program has not resulted in any identifiable job losses in the industries subject to cap and trade in the region. If there has been a small impact, it has been overshadowed by much greater economic forces such as the general economic recovery and the low cost of crude petroleum. Employment figures (as reported by the California Employment Development Department) for the biggest industries affected by cap and trade are shown in Figure 1. Oil and gas, transportation fuel distributors, electricity generation, and manufacturing were the main industries needing to comply with cap and trade, while the construction industry was the main beneficiary of cap-and-trade proceeds. 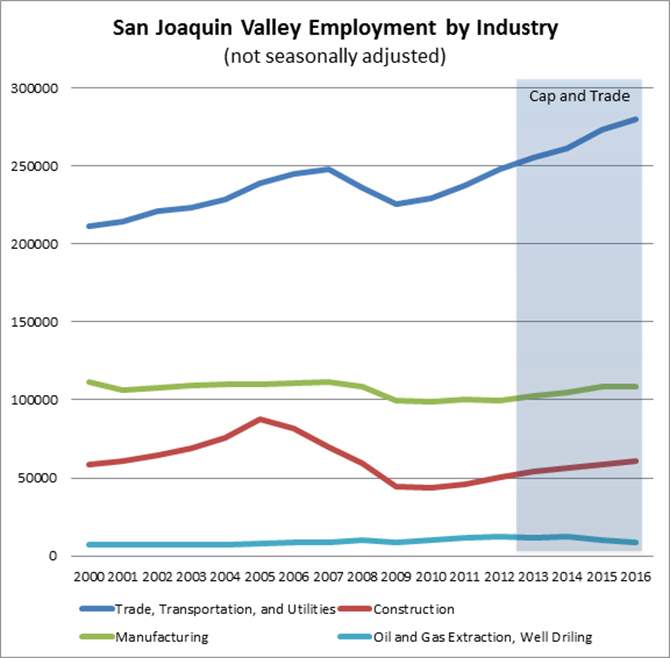 Beyond the few industries shown in this graph, there were increases across every industry in the San Joaquin Valley since 2012. The exception is oil and gas extraction, which saw an abnormal 50% increase in employment between 2009-14 when oil prices were high, and by 2016 had returned to its 2009 level. These fluctuations show a volatile industry, but the resulting employment impacts are almost imperceptible in Figure 1, showing the relative insignificance of this sector in terms of regional employment. In addition to the state’s high-speed rail project and other construction investments from the cap-and-trade program, the Renewables Portfolio Standard (RPS) has been and will likely continue to be a significant driver of investment and job creation in the San Joaquin Valley. 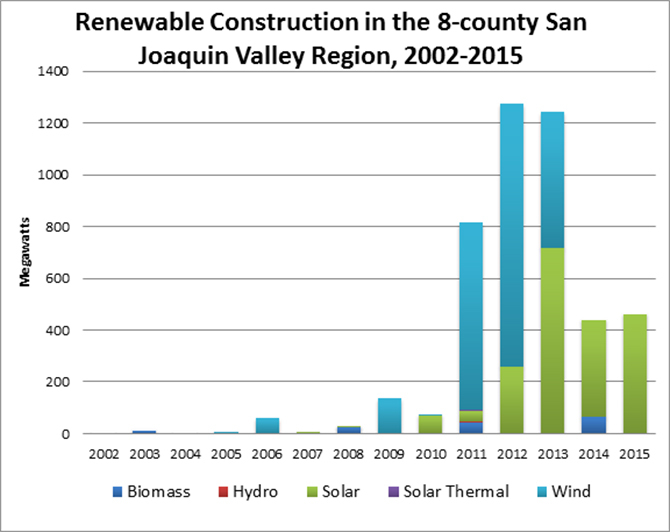 Throughout the early 2000s, some natural gas power plants were built in the San Joaquin Valley, but over the past decade, renewable energy generation has proven to be a much stronger economic driver for the region. In addition to their air quality benefits, renewable power plants are fractional users of water relative to traditional power plants, making them more resilient to drought. In the San Joaquin Valley, we estimate that the RPS has created almost 7,500 blue-collar construction job-yearsii (over 15 million job hours), most of them since 2011. Because the majority of California’s large-scale renewable energy projects are built under project labor agreements (PLAs), workers on these jobs received union-scale family supporting wages and benefits including training, pension contributions, and family health care. Furthermore, these jobs creation numbers may substantially underestimate the actual number of jobs created, as they do not include work on new transmission infrastructure or substations often required to connect these renewable energy projects to the grid. These investments are not only creating jobs in a region plagued with high unemployment and poverty rates, they are training people with transferable and valuable skills and creating resilient careers for men and women throughout the region. The investment in renewable energy in the region has created job openings for over 500 new apprentices—entry-level men and women who participate in earn-as-you-learn career training while helping build the state’s renewable infrastructure. In addition to the training contributions, we estimate that the renewable energy investment in the Valley region has contributed almost $98 million toward worker pensions and over $115 million in health insurance contributions, thus ensuring that these projects contribute to the tax base rather than burdening public services. Quality jobs are possible in other sectors too. Energy efficiency is a high-return investment in the San Joaquin Valley, where each dollar of spending represents $1.50 in future avoided energy costs. About two-thirds of energy efficiency jobs are blue-collar construction jobs, and because they mostly pertain to building upgrades and retrofits, they are jobs that cannot be outsourced to other regions, states, or countries. California’s energy efficiency industry, which is heavily influenced by the investor-owned utility rebate and incentive programs and the states codes and standards, does not, however, have the same job standards as are negotiated in project labor agreements. While the varying degrees of complexity in energy efficiency projects could create natural career ladders—abundant opportunities for entry level workers and upward mobility as workers gain skills and experience—the industry remains fragmented and has yet to capture that potential. The utilities and the CPUC have been slow to respond to workforce recommendations they commissioned on how to best attract and engage a skilled workforce to meet the state’s energy goals. We estimate that the investor-owned utility programs have created over 6,600 direct job-years (13.7 million job hours) in the Valley, but continued emphasis of the programs on short-term basic energy efficiency measures, over longer-term more comprehensive savings limits the investment and job creation potential of these programs. Workforce standards create an incentive to train and retain workers, resulting in better pay and better long-term employment opportunities. Workforce standards for energy efficiency programs would not only create better long-term employment opportunities, they also would increase the effectiveness of the energy efficiency programs. Studies have shown that lack of workforce standards has resulted in poor installation of energy efficiency measures. This in turn has resulted in much lower energy savings than are assumed (see Appendix 2B of DVC Guidance Plan). In addition, poor-quality installation also gives promising measures, like lighting sensors and controls, a bad reputation, contributing to consumer reluctance to make the investments the state wants to see in energy efficiency. While the Valley is well-served by the Energy Services Assistance Program (ESAP), which provides weatherization services to low-income households, the Valley is receiving a smaller share of the much larger pot of IOU incentives for residential, commercial, industrial, and agricultural efficiency. Per household energy use in the San Joaquin Valley is higher than the state average, and strategic energy efficiency investments targeted to the Valley could help address energy affordability in the Valley. Restructuring the IOU incentive programs to increase investment and energy savings in the San Joaquin Valley, expanding on-bill financing, and aggregating funding streams to create more comprehensive programs would be compatible with meeting the state’s energy goals while expanding opportunities for the California workers. While many of the state’s climate policies and programs are designed to limit economic pain and accelerate economic gain, continued progress will require ongoing refinements. The economic benefits of cap and trade are dependent on the state’s ability to strategically re-invest revenue generated from the auction or other mechanism. Without the cap and trade auction or other revenue collection mechanism, the costs of cap and trade would not be as beneficially offset by the investment of its revenues as has been the case so far. In the renewables sector, the solar and wind energy potential and transmission capacity of the Valley will continue to attract investment and create jobs and other economic benefits in the region. Competition with other states and regions, however, could have an unfavorable effect on the creation of middle class jobs, apprenticeship openings, and other benefits renewable growth has stimulated in the Valley. Finally, while energy efficiency is a sound investment, California needs to revamp its incentive programs to better stimulate the market in order to meet its doubling goals. Prioritizing investments where energy use is high and designing programs to engage the participation of skilled workers are necessary components (in addition to others) of any strategy to double energy savings by 2030. The San Joaquin Valley plays a critical role in shaping California’s climate policy and functions as a bellwether of the state’s transition to a low-carbon economy. So far, this transition is working well for one of the state’s most vulnerable regions and the workers who live there. i. The jobs reported in this cap and trade section refer to all jobs over the period covered, whether they are full or part-time, “temporary” or “permanent”. This is how IMPLAN reports jobs and also how EDD reports their employment estimates. ii. Unlike in the Cap and Trade section, for the Renewables Portfolio Standard and Energy Efficiency programs, we report job-years. A job-year is equivalent to 2080 work hours.